You've arrived at the home page of Eugene Woodbury. My reviews, essays, and other musings and announcements usually first appear on my blog. The main purpose of this website is to discuss the novels I've written, translated, and published together with my sister Kate. If you're new to Fuyumi Ono's Twelve Kingdoms fantasy series, see this guide to the novels. The best book to start with is Shadow of the Moon. Donna Howard is an ordinary girl with the extraordinary ability to see deceased people from the past. In Coin, an ancient Roman coin is the key to unraveling a fatal "accident." 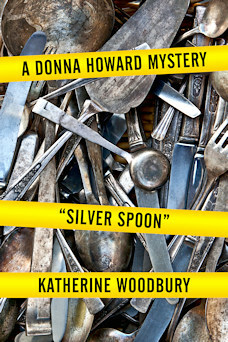 Then in Silver Spoon, Donna travels to Salem, Massachusetts, to investigate a haunted silver spoon and the death of the old man who once owned it. In Fox & Wolf, a werewolf and a werefox have to stop fighting each other long enough to join forces against the yakuza thugs threatening their families. Debutante Aubrey St. Clair went to a ball and got turned into a cat. As she discovers in Aubrey: Remnants of Transformation, becoming fully human again may be the last thing she wants. Caught up in a failed revolt against the shogun and forced to flee for her life, Princess Ryô must ally herself with her family's ancient enemy, the wily Serpent of Time. To save a young woman from a band of marauding students, Lord Simon bespelled her into the walls of his house, a spell so powerful he will spend the rest of his life battling its effects. Richard: The Ethics of Affection explores the tangled web of politics, romance, and magic that results when rising civil servant Richard St. Clair succumbs to a love potion. Tales of the Quest takes up the history of Roesia in this exploration of the Heroic Quest, from its violent beginnings to its pragmatic and often humorous present. Can true love still triumph amidst all the game playing? Persuadable takes on the nemeses of Jane Austen's Persuasion: the scheming Mrs. Clay and the wily Mr. Elliot. Who says a couple of gold diggers can't find true love? Did Mr. B, the famously redeemed rake of English letters, romance his great love or abuse her? Mr. B Speaks! hauls the man into court, where must defend his actions before skeptical scholars and an unsentimental judge. Adaptations of Jane Austen's most beloved work often transform Fitzwilliam Darcy into the stereotypical alpha male of Regency romances. In A Man of Few Words, Darcy steps forward to set the record straight. Angel Falling Softly is an urban fantasy about the wife of a Mormon bishop who strikes a Faustian bargain with a literal Wall Street vampire to save her daughter's life. But blood alone will not settle the debt she now owes. Links to the novels I translated for Digital Manga are listed in my bibliography. My translations of Fuyumi Ono's Twelve Kingdoms novels can be read on this website or downloaded as ebooks. Background patterns courtesy of Gokuraku Ho-Ten and Subtle Patterns. Corrections and clarifications are welcome. If you'd like to toss a few quarters into the cup, please consider one of our books.